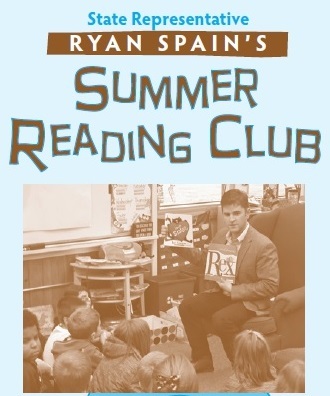 State Representative Ryan Spain announced the official launch of his First Annual Summer Reading Club Program for grade school students who live within the 73rd Legislative District. The program is offered to encourage students to read over the summer and promote the lifelong benefits of literacy. “Students who read over the summer enter the school year in the fall ahead of students who do not read over the summer. This is a fun way to reward students with a free ice cream and swimming party for simply reading eight books over their summer break and returning a form signed by a parent or guardian to invite them to a swimming party. It’s incumbent on all of us in the community to encourage students to get ahead by becoming better readers,” said Spain. Brochures were distributed recently through area schools, but are also available below or by calling Rep. Spain’s Peoria District Office. Participation in this program can overlap with any other summer reading program offered through area libraries. Participating students have until July 31st to read their eight books and will be invited to a Summer Reading Ice Cream & Swimming Party in August upon completion of the program. Attendees of the party will also be given an opportunity to receive information on college savings programs offered through the State of Illinois.